A great trade in program for all XP3 series owners. By sending in your XP3.1 standard together with a charge of USD 1,300 you will receive the latest Ace One, By sending in your XP3 series Waypoint together with a charge of USD 2,500 will receive the latest Ace Waypoint. The built-in tail gyro, FBL, improved algorithm, quick compass calibration and more powerful ground station system, also adding 2 more years warranty and upgrade support to name a few makes the trading-in for Ace One / Ace Waypoint an irresistible choice. Please contact your dealer for more information or send us an email to Sales@DJI-Innvoations.com. Shenzhen Dajiang Innovation Technology Co., Ltd.
Once we confirm that your unit is in good condition, we will inform you to wire the fee, or we will charge an additional fee for the product depreciation. a great trade in program for all XP3.1 owners, by following process you will receive the latest ACE series. 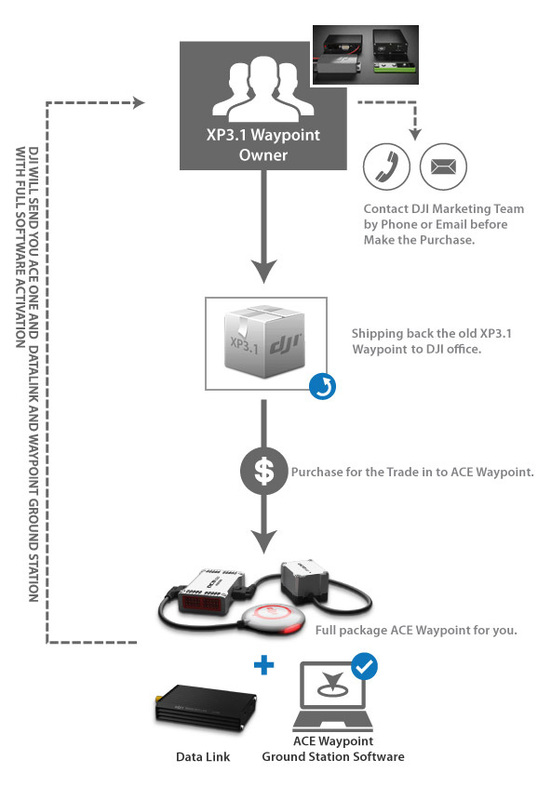 a great trade in program for all XP3.1 Waypoint owners, by following process you will receive the more powerful ACE Waypoint.